When I think back over my life I have to believe there was some force that was keeping me safe from harm. There were numerous times in my early years when I should have been killed. Miraculously I always escaped alive, and except for one serious traffic accident that occurred during my college years, walked away totally unscathed. Even the accident may have been a blessing in disguise. It occurred two weeks before I received notice from my draft board to report for a physical exam for military service. My injuries were severe enough that I missed the Vietnam War. My first near miss occurred when I was so young I was still riding a tricycle on the sidewalk in my neighborhood. While I am sure my parents put strict rules on just how far and where I could ride on that tricycle, I broke the rules one summer day. I rode across the highway on the invitation of a girl who lived across the street. I did not bother to look to see if anything was coming. Suddenly there was a loud screech of tires and the blare of a car horn in my left ear. I froze in my place. I looked up to see the hot chrome radiator of a car stopped a few feet from me. I peddled quickly on to the other side of the street, shaken but still intact. A few years later when I was in grade school the city extended water and sewer lines from our neighborhood south to a small cluster of houses about a quarter of a mile away. Workers dug a deep trench from about where our house stood. When construction workers went home that night the children in the neighborhood found that trench, about five or six feet deep and two feet wide, an exciting thing to run through. It was a very long and deep trench, or at least it seemed deep to us as children, and we had a wonderful time running back and forth through it. I don’t know what ever possessed me to do it, but the next afternoon after getting home from school, I decided to do a solo dash through the trench. Somewhere in the middle of my run I heard someone above me yell “Hey…..Look out!” I stopped dead in my tracks just as a large iron pipe dropped in front of me. It probably would have killed me if I had taken another step. That worker was lecturing to me as I retreated. There was the near-fatal crash while I was riding with two high school chums in a 1949 Mercury. I was not driving. We were racing another car and hitting speeds clocked at 105 miles per hour and passing two slower moving vehicles just before coming to a dip in the road ahead. Suddenly an oncoming car popped up out of the dip and it looked like we were about to die in a head-on collision. The driver of our Mercury tried to brake and slip in between the two cars we were passing. The car skidded sideways out of control and slammed into the rear of the car ahead of us, then careened off the road and between two large trees. Amazingly the vehicle stopped upright in an open field. We all walked away from that crash without a scratch. 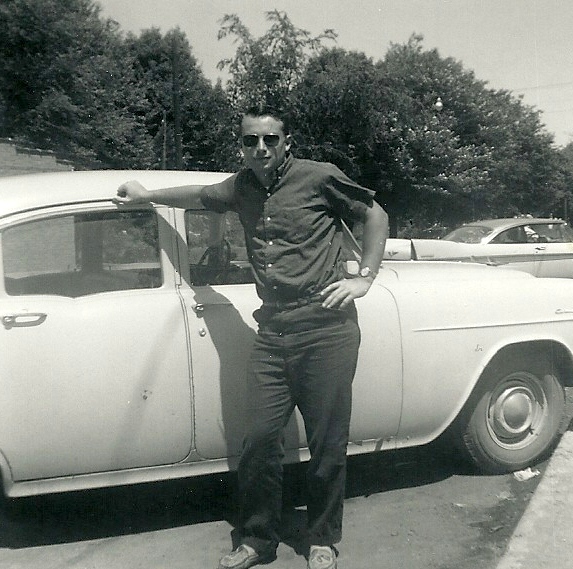 That 49 Mercury and my father’s 1950 Buick were both heavy cars powered by V-8 engines. We often had permission to drive those cars on Friday and Saturday nights when we gathered at Mom’s Dairy Bar to do stuff that teenage boys liked to do. Mostly we drove those cars around town, hoping to pick up girls. Sometimes we raced the cars. Back in the 1950’s the highways in and around Harbor Beach were new and there weren’t a lot of cars on them. The highway north of town, between Harbor Beach and Port Hope, was a perfect race track after hours. We discovered that the Mercury, which clocked at 105 miles per hour on the speedometer, was not as fast as my father’s Buick, which only clocked at a top speed of 95 miles per hour. We knew one of those speedometers was not as accurate as the other but never found out which one it was. One noon-hour I had the Buick at school for the day. I took a few friends for a ride that day and we opened the car up on the highway south of town, just to see if we could get any faster speed out of it. When we got back at the school I turned into the high school parking lot and kept on turning. We had dropped a tie-rod at that moment and the car ended up on the school lawn. Had that happened a few minutes earlier we would have ended up in a pile of wreckage somewhere along M-25. During my freshman year in college, I had a new roommate named Al who moved into my dormitory room after spring break. He was a Korean War veteran, enrolling in college on the old GI Bill. He just bought a new Ford Fairlane. It was painted pink, black and cream. I remember it as the most gaudy looking car I had ever seen. But Al was proud of it and wanted to take me and another roommate for a ride. We were having an ice storm that night and the road was pretty slick. As we headed away from campus on an ice-coated and crowned blacktop road, Al gunned it. I suggested that we slow down a little. I had experience driving on ice and knew Al was going too fast. He laughed at my concern, said the road was just fine, and to prove his point, whipped the steering wheel. The car immediately skidded out of control and we crashed upside down in a ditch. The doors were jammed and we had a difficult time figuring out how to get out through a window. We could smell gasoline dipping around us as we wiggled our way out of the wreck. I worried that the car might go up in flames before we escaped. All three of us walked away from that wreck without a scratch. Those were days before cars had seat belts. In my senior year I was driving a compact Renault. It was probably one of the first sub-compact foreign cars, other than the Volkswagen Beetle, appearing in America in those years. During the fall homecoming football game and dance, I invited Bernice, a girl I had met in Port Austin the prior summer to be my date for the weekend. She was a Harbor Beach native who lived and worked in Detroit. I drove half way to Williamston to meet her. She came by bus to meet me, rather than make me go through the difficult maneuvers of finding my way around the big city. From there we drove back to Mount Pleasant. We were only a few blocks from our destination when my car was in a collision with a full sized vehicle at an open intersection. Just how the accident happened has always been a mystery and has remained a blacked-out moment in my memory. The little car we were in was demolished. I found myself face down on the pavement, the car wheel on my right shoulder. People pulled the car off of me. I never knew where Bernice ended up. An ambulance took us both to the hospital. I suffered a skull fracture and severe brain concussion and was on the critical list for the first few days. It was two weeks before I checked out of the hospital. Bernice also was hospitalized for a few days for some cuts and bruises. The accident changed the course of my life. While my physical injuries were minor, my brain was severely bruised. I couldn’t read and comprehend what I was reading well enough to finish college for another two years. While in the hospital I was in a room with Jack Long, one of the owners of Long and Wetzel, an oil well servicing business headquartered in Mount Pleasant. Jack and I hit it off and before I checked out, he offered me a job the next spring since it was evident I would not return right away to school. I took him up on the offer. He put me to work on a light line truck, cleaning paraffin out of oil wells in the Jonesville area. There had been a new strike in the area and it was a busy place, with new drilling, pipe fitters, and pumping wells all over the place. Before I went to Jonesville, however, I worked a week or two with Ted Case on some jobs in the middle section of Michigan’s Lower Peninsula. Ted trained me. My job was to shut off the well head, open the cap, attach a long pipe, then scale that pipe on welded iron steps, and drop a heavy iron sinker into it. The sinker had a steel brush on the lower end. The top end was attached to a light wire that passed through a rubber plug, over a pulley and then down to the ground. Once in place, we opened the well, which was always under pressure. We then stood in a shower of warm crude spraying through the tiny hole in the rubber plug and “spudded” the brush through the paraffin. Paraffin is a wax-like substance in crude oil that collects on the inside of the iron pipe because the crude cools while flowing up from deep in the ground. It has to be scraped out regularly or the wells plug completely off. We sometimes worked on one well for hours until we brushed the well clean. It was a hard and dirty job, but I liked the work. The last job I did in that area with Ted was on Easter Sunday. We were both upset that we had to work that day. I don’t remember why it was so important but the company said the job had to be done, so Ted and I volunteered. It was a cold rainy miserable day we were working in mud up to our ankles. It was so muddy our truck had to be dragged on the site and positioned with the help of a bulldozer. When we broke for our lunch at noon and climbed in the truck cab Ted attempted to start the engine and turn on the heater to get us dried out and warm. The engine coughed and suddenly we saw smoke rolling out from under the hood. The truck was on fire and we were set up on a wire at a partly opened and spitting oil well! We carried a fire extinguisher on the passenger’s side of the truck where I was sitting. I jumped out of the truck, grabbed the extinguisher, handed it to Ted, and he extinguished the fire. Later he asked me how I was able to get the fire extinguisher off the truck as I did. Because of possible theft, he said the device was locked in place. In order to get it free it had to be unlocked and Case had the key. We found that in my excitement I snapped a steel pin that locked the extinguisher in place. It took some kind of superhuman strength to have done that. I later tried several times to break that pin and never could do it again. Ted and I were sent to Jonesville the next day and given temporary quarters in a local motel. We worked together all that week. That weekend I left the area to visit a friend. When I got back on Sunday I found the motel room had been wrecked. There was plywood over the windows and doors. There was no sign of Ted. I was told that a gang of men ravaged the place and beat Ted so badly he was in the hospital. I had escaped that episode by pure chance. I was next assigned to work with Ted’s brother, L. V. “Corky” Case on the same kind of rig. This truck was a larger one with a four wheel drive transmission. It was designed to take us places where most other vehicles couldn’t go. And we went through some very tough places, even through muck, across streams and shallow lakes, to get to some of the wells we worked on. One day we set up at a well that was so choked with paraffin that we could not get a normal sinker with even the thinnest of our brushes to break through. To solve the problem, we decided that we had to use an extra long and extra heavy weight. That involved attaching a second iron weight on the first, and then hoisting a very long sinker weighing well over a hundred pounds high over my head before dropping it into the pipe. I had by then acquired quite a bit of strength and succeeded in lifting that sinker over my head. But while sliding it into the pipe, my oil-soaked gloves let it slip and it dropped with a hard thud all the way to the cast iron well-head. Case and I both expected the head to crack. Had that happened, the well would have blown. I probably would have been killed at my perch high over the well. Miraculously, it didn’t happen. Somehow I survived all of the mishaps, went on to finish college, met Doris, got married, and we raised our family. But all of that is the rest of my story.